Happy New Year! Mike and I rang in the New Year at the hospital with Maddie. She woke up right at midnight, then quickly fell back to sleep. I enjoyed starting the new year with my baby in my arms. She really cleaned up at Christmas. She got lots of great books, DVDs, and toys, and some really adorable outfits. She is already one stylish baby. Maddie has made lots of improvements in the last week. First, she is maintaining her body temperature, so she no longer needs to be in an isolette. She is now in a crib, which is great because we can really personalize it. She has all kinds of toys (all so kindly sent to her by her many adoring fans) and blankets, which make her bed much homier. She also has a little CD player attached to the crib, and we put a “Baby Beatles” CD in it. Mike likes to tell her which Beatle wrote each song, and the album the song originally appeared on. Hee. She has made HUGE strides in her eating. She’s eating an ounce every three hours, so she’s more than halfway to her goal amount of an ounce and a half per feeding. She gets pretty tired after she eats now that the volume is up, which is typical for preemies. She usually will take half of each feeding via bottle. When she is too sleepy for a bottle, she will get her food from a tube that goes through her nose into her belly. Once she gets to an ounce and a half, she has to start taking every feeding by bottle before she can go home. She still has the nasal cannula, but it is offering her minimal breathing support. The doctors would like to take her off it completely in the next few days. Then we will be able to get a picture of her face without all that tape on it! I can’t wait to kiss her chubby cheeks. 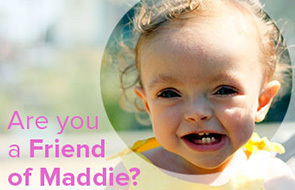 We are in the home stretch here with Maddie. The superstitious part of me doesn’t even want to type that, but it really seems to be true. We have been furiously preparing for her arrival, and have started clearing out our extra bedroom for her. The nursery furniture arrives tomorrow and we’re painting the walls this weekend. Hopefully her Rock and Roll bedroom will be all ready for her when she finally arrives home! What an amazing baby. I found this blog from reading someone else’s blog, but unfortunately I only started reading a couple of weeks before Maddie passed. Now going back to the beginning I am amazed at what a strong, beautiful child your daughter was! I’m so sorry for your loss, but what a wonderful way to make sure Maddie’s life is remembered by so many people.